Don’t settle for hiding or hating your smile! 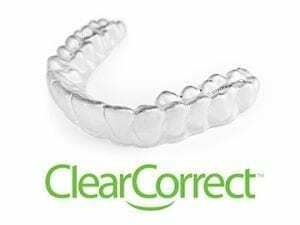 ClearCorrect® is an invisible aligner-based orthodontic technology that allows your dentist to move your teeth into a new position without traditional metal braces. This innovative treatment is an alternative to Invisalign. Objectively, neither aligner is better or worse than the other—it just comes down to patient preference. With ClearCorrect®, loving your smile is possible! Visit Arlington’s leading dentist, Dr. Budhani, to get a smile you’ll want to show the world! This innovative orthodontic treatment utilizes a series of clear plastic aligners to move your teeth into a new position. Treating orthodontic concerns is advised not just for aesthetic reasons. Correcting orthodontic issues will help ensure your overall and oral health. Overcrowding, bite issues, and misaligned teeth can lead to periodontal disease, head and neck pain, and damage to surrounding teeth. Choosing to get the straight, radiant smile you’ve always wanted is an investment in your overall health. Since the aligners are clear, ClearCorrect® offers you an invisible discreet alternative to traditional orthodontic treatments. Superior finish for an ultra-clear aligner so no one will even know you’re wearing them! Once you and Dr. Budhani decide that ClearCorrect® is the right choice for you, he will take an impression of your teeth that he will send off to the lab where your custom aligners will be made for you. The lab will work closely with Dr. Budhani to develop a series of aligners that will gradually move your teeth into the desired position. Once you have your custom aligners, you will need to wear them for at least 22 hours a day 7 days a week. During the course of your treatment, you will need to see Dr. Budhani periodically to ensure that your treatment is working as it is expected to progress. Almost everyone is a candidate for this innovative, non-invasive treatment. Getting the smile you’ve always wanted is more affordable and attainable than ever before! If you’re ready to get that straight, radiant smile you’ve always dreamed of, call Amazing Dental’s Dr. Budhani today at (817) 484-5588 or request an appointment online to schedule your free consultation.